I muse, therefore I write. Think about the last time you spoke to somebody. Chances are, they lied to you at least once, most likely more. 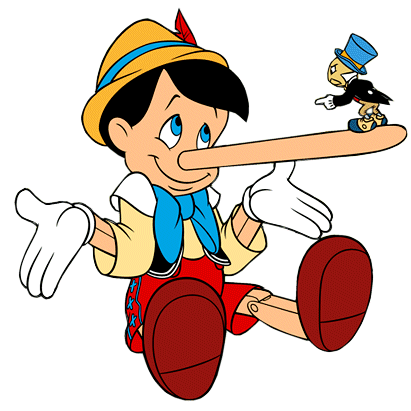 Lies are everywhere in society, from “harmless” white lies to big, hulking monsters like Enron. Let’s face it, everybody. Lies are a part of the American lifestyle. No, let me rephrase that. Lies are the American lifestyle. Lies permeate every single bit of the culture of this “great” country. Our politics is basically a series of lies, one after the other. Like the recent news that George W. (Dubya) Bush actually drove us $2.7 trillion more into the ditch than he let on in public. Or the all-too-familiar “I did not have sexual relations with that woman.” Or the total lie that was Sarah Palin’s competency. It’s all there. Of course, lying’s not just for people. America’s textbooks have been full of lies for, well, the entirety of American history. What’s worse is, our teachers believe them. They say it’s easy to tell if a person’s lying. If they hold eye contact when recalling past events, if they bite their lip or smirk at the wrong time. People either get good at discovering lies, or they are lied to for the rest of their lives and end up never going anywhere. But the thing is, you can’t really tell if a book’s lying to you. A book doesn’t have a face, nor body language clues that we can pick up on instinctively. And thus, written propaganda can skew our perceptions of our fellow man, tell us things in order to cover up for other things that are true but rather nasty, and many other purposes. And that is why propaganda is so prevalent. I know, I know, propaganda is only associated with Russia and dictatorships. However, that’s not true. Propaganda is everywhere. It would take too long to describe each and every single kind of propaganda that exists in the print media I have scattered around my room, so let’s focus on the one example I have in front of me: The American Pageant, 10th Edition by Bailey and Kennedy. My goodness, are these guys good at their job or what? And by that, I don’t mean writing US history textbooks. These men are master propagandists. They glorify US policy wherever possible, and demean and denounce everybody and everything that ever had the gall to stand in the US’s way. For example, dear reader, look at the cover of your textbook. Its title is The American Pageant. Pageant… pageant…. that’s like that thing with the bikini models, right? Yeah! Like Miss America! Where are my bikini models, Pageant? Oh…. you mean it’s a history text? Awww… well, maybe the book will have some pictures of bikinis in it, right? In the fateful year 1492, probably no more than 10 million Native Americans padded through the whispering, primeval forests… of North America. And the native population of Mexico…shrank from more than 20 million to 2 million people in less than a century. Wait… what? Where did 20 million people come from? Did everybody on the entire continent spontaneously make babies? And then move to Mexico? WTF? It’s pathetic and disturbing. I am ashamed to be learning anything out of this travesty of a textbook. P.S. The madness is present throughout the book. Remember how Koenig said that if you find something stupid in the book, to email it to him? Please. Please please please do so. Maybe when he gets hundreds of dumb, racist, and just plain wrong quotes, he’ll be forced to change the textbook entirely. And shut up about how awesome the Pageant is. I don’t care if you’re not even in Koenig’s class. Do it anyway. I don’t think, as far as I know, that there is any *AP US* textbook which isn’t significantly flawed. Every history is biased in one way or another, and it is unreasonable to expect the teachers to change from a textbook which has done a fine job teaching to the AP test, which is all anyone really cares about, anyways.